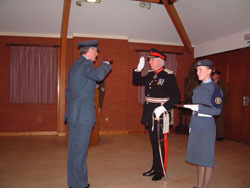 Pilot Officer John Anthony Cooksey RAFVR(T) was awarded his Lord Lieutenant's Certificate for Meritorious Service after dedicating over 14 years to the Ait Training Corps. 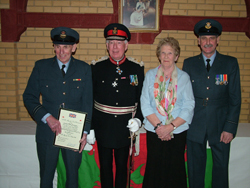 The award was made at John Chard VC House, Swansea on Tuesday 16th February 2007. 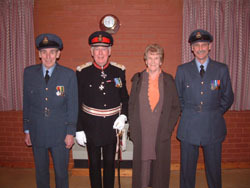 Flight Lieutenant Thomas Sidney Fry RAFVR(T) (ret'd) was awarded his Lord Lieutenant's Certificate for Meritorious Service after dedicating over 50 years to the Uniformed Branch of the Service. 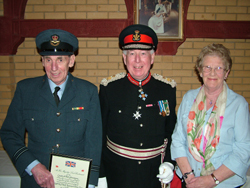 He was accompanied by his wife, Mrs Marjorie Fry and his son, Flight Lieutenant Richard Fry at the ceremony at John Chard VC House, Swansea on Tuesday 21st February 2006. 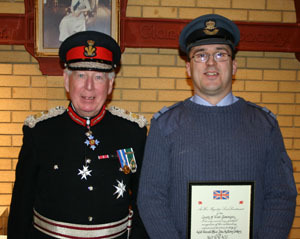 The Lord Lieutenant of West Glamorgan, Commodore RC Hastie, presented Warrant Officer Steven John Hill, with his Certificate of Meritorious Service. This accolade rewards his outstanding dedication to the Air Training Corps and his many achievements whilst with the Squadron. WO Hill was accompanied by his mother, Mrs Margaret Hill, at the presentation. WO Hill holds the post of Squadron Shooting Officer and has achieved historical results in this field within the past five years. He has guided his shooting teams to the following successes: Wales and the West of England Regional Shooting Champions for three consecutive years (four times in all), Best Marksman Award in Wales and the West of England Region for four years, No 3 Welsh Wing MK 8 Champions for five consecutive years, No 3 Welsh Wing Best MK 8 Marksman Award for five consecutive years, five Corps Marksman Awards 2005, Bisley 2003, Bisley 2004, CISSAM 2004 and the Squadron's First Cadet 100 Marksman in 2004. WO Hill has also trained four Cadets who helped win the Corps Whistler Trophy for No 3 Welsh Wing in 2005. 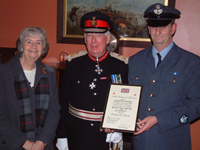 The Lord Lieutenant of West Glamorgan, Commodore RC Hastie, presented Flying Officer Richard Fry, with his Certificate of Meritorious Service. This accolade rewards his outstanding dedication to the Air Training Corps and his many achievements whilst with the Squadron. Flying Officer Fry has been the Squadron Signals Officer and Health and Safety Officer for over ten years. 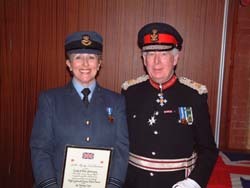 The Lord Lieutenant of West Glamorgan, Commodore RC Hastie, presented Flight Lieutenant Lorraine Flower, with her Certificate of Meritorious Service. This accolade rewards her outstanding dedication to the Air Training Corps and her many achievements whilst with the Squadron. Flight Lieutenant Flower has been the Squadron Adjutant for over ten years and is also the ATC Junior and Senior Netball Team Manager and Coach, a position she shares with Squadron Leader Amanda Smith.